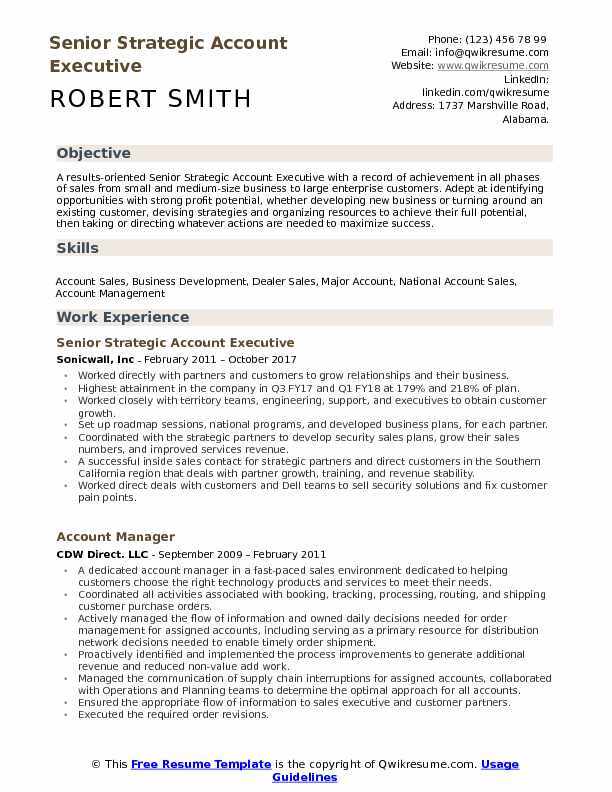 The role of a Strategic Account Executive is to maintain and expand the relationship with strategic client accounts. These Executives are accountable for achieving sales target and assigned strategic account objectives. 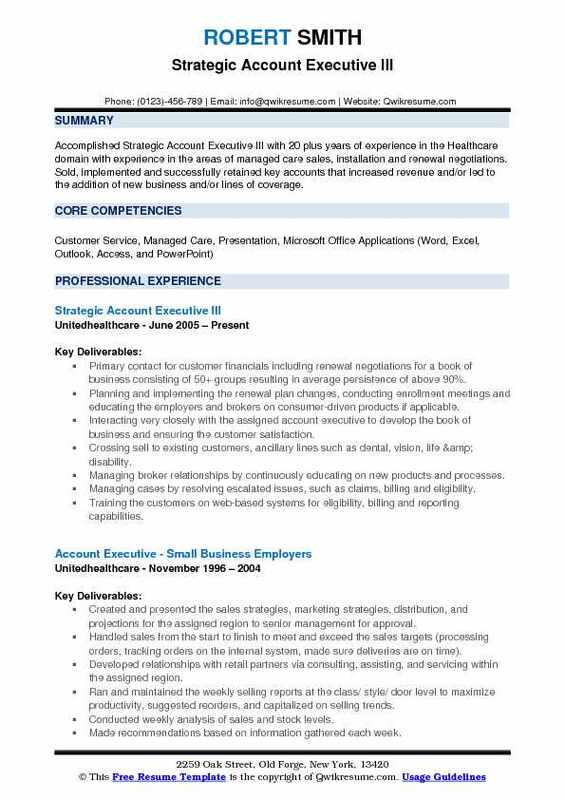 The major responsibilities listed on the Strategic Account Executive Resume include – managing the portfolio of key accounts, achieving assigned strategic account targets, establishing long-term strong client relationship, suggesting innovative and creative ideas that meet client’s needs, handling complaint and queries; and monitoring sales performance metrics. To shoulder the above-mentioned accountabilities, the candidate should demonstrate skills and abilities such as – solid sales experience preferably in the B2B platform, knowledge of CRM and Account management system, the ability to understand and address customer’s issues, strong negotiation skills and knowledge of sales performance metrics. A Degree in Sales or Business Administration is the common qualification seen among candidates applying for this role. 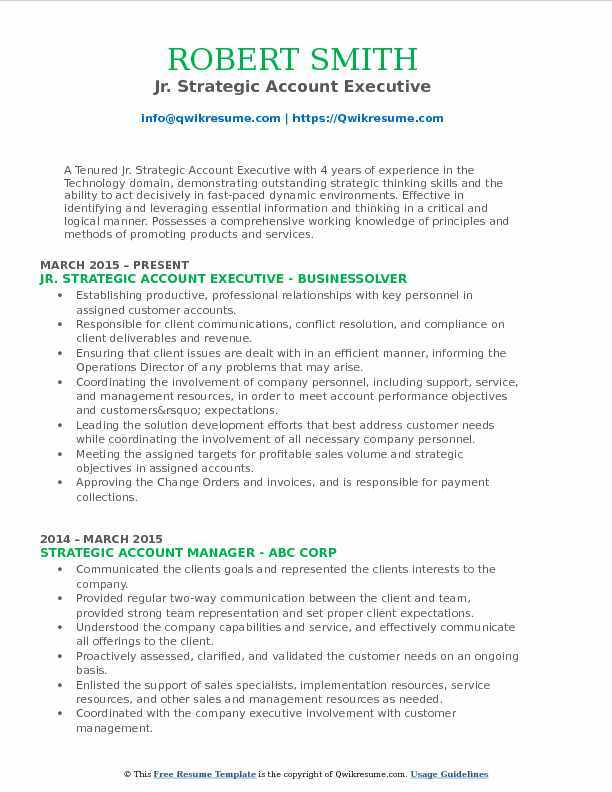 Summary : A results-oriented Senior Strategic Account Executive with a record of achievement in all phases of sales from small and medium-size business to large enterprise customers. Adept at identifying opportunities with strong profit potential, whether developing new business or turning around an existing customer, devising strategies and organizing resources to achieve their full potential, then taking or directing whatever actions are needed to maximize success. Worked directly with partners and customers to grow relationships and their business. Highest attainment in the company in Q3 FY17 and Q1 FY18 at 179% and 218% of plan. Worked closely with territory teams, engineering, support, and executives to obtain customer growth. Set up roadmap sessions, national programs, and developed business plans, for each partner. Coordinated with the strategic partners to develop security sales plans, grow their sales numbers, and improved services revenue. A successful inside sales contact for strategic partners and direct customers in the Southern California region that deals with partner growth, training, and revenue stability. Worked direct deals with customers and Dell teams to sell security solutions and fix customer pain points. Head of the Dell Sonicwall insiders, an employee based group that hosts training for the entire team. An inside rep tasked with growing the preferred market within the Sothern California territory sales. Mentored three reps on the team and helped them understand the business and best practices. Grew team relationships with the Dell direct team while still maintaining a strong channel. 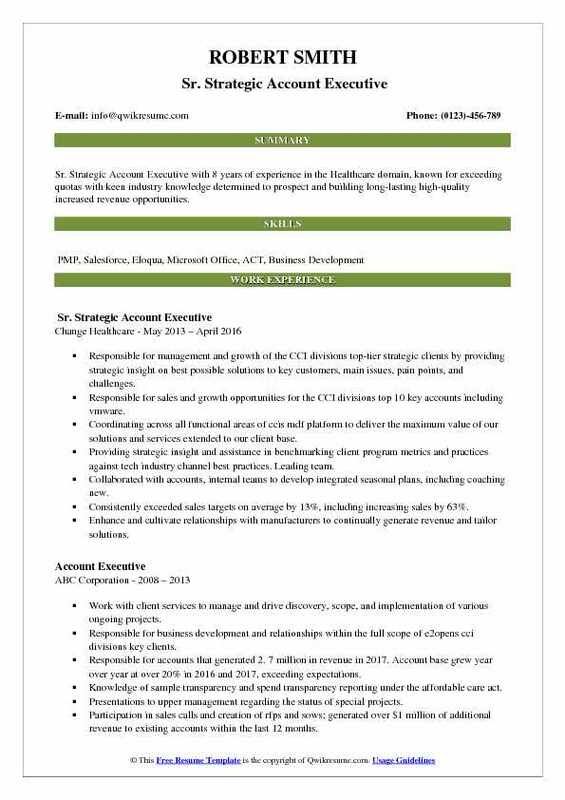 Summary : Accomplished Strategic Account Executive III with 20 plus years of experience in the Healthcare domain with experience in the areas of managed care sales, installation and renewal negotiations. Sold, implemented and successfully retained key accounts that increased revenue and/or led to the addition of new business and/or lines of coverage. Primary contact for customer financials including renewal negotiations for a book of business consisting of 50+ groups resulting in average persistence of above 90%. Planning and implementing the renewal plan changes, conducting enrollment meetings and educating the employers and brokers on consumer-driven products if applicable. Interacting very closely with the assigned account executive to develop the book of business and ensuring the customer satisfaction. Crossing sell to existing customers, ancillary lines such as dental, vision, life & disability. Managing broker relationships by continuously educating on new products and processes. Managing cases by resolving escalated issues, such as claims, billing and eligibility. Training the customers on web-based systems for eligibility, billing and reporting capabilities. Developing and implementing the strategy for new business and renewal contract installation. Identifying and coordinating the enrollment needs as well as facilitating the benefit presentations for local and national employer groups. Provided on-going service support to insure the most efficient utilization of health plan benefits and resources for over 120 employer groups encompassing over 35,000 subscribers statewide. Acting as a liaison between external and internal customers such as member services, network management, billing, eligibility, underwriting and finance to escalate issues within the organization and providing resolution. Summary : Sr. Strategic Account Executive with 8 years of experience in the Healthcare domain, known for exceeding quotas with keen industry knowledge determined to prospect and building long-lasting high-quality increased revenue opportunities. Responsible for management and growth of the CCI divisions top-tier strategic clients by providing strategic insight on best possible solutions to key customers, main issues, pain points, and challenges. Responsible for sales and growth opportunities for the CCI divisions top 10 key accounts including vmware. Coordinating across all functional areas of ccis mdf platform to deliver the maximum value of our solutions and services extended to our client base. Providing strategic insight and assistance in benchmarking client program metrics and practices against tech industry channel best practices. Leading team. Collaborated with accounts, internal teams to develop integrated seasonal plans, including coaching new. Consistently exceeded sales targets on average by 13%, including increasing sales by 63%. Enhance and cultivate relationships with manufacturers to continually generate revenue and tailor solutions. Collaboration with compliance and regulatory personnel to provide additional support to the client through the implementation process. 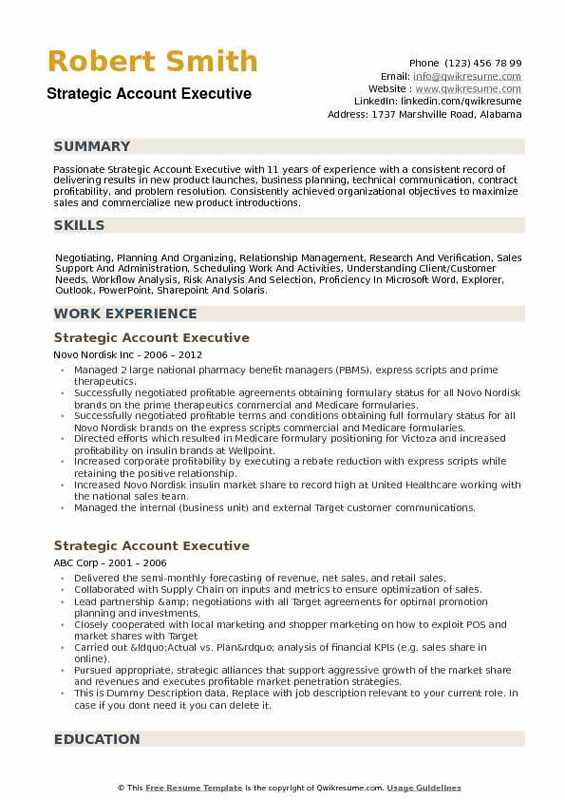 Objective : Hardworking, motivated, and accomplished Junior Strategic Account Executive with 3 plus years of experience in the Sales and Marketing domain, looking to apply my experience and knowledge of sales, as well as my talent in communication, relationship building, and leadership. 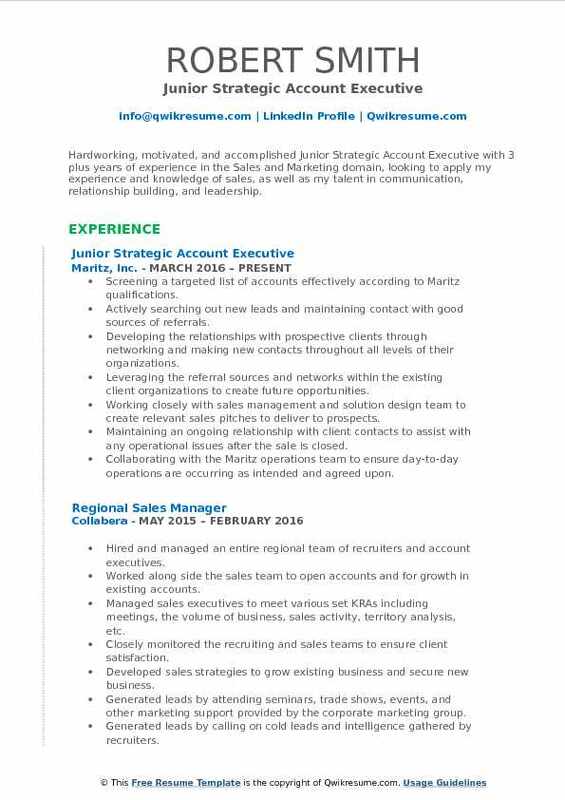 Screening a targeted list of accounts effectively according to Maritz qualifications. Actively searching out new leads and maintaining contact with good sources of referrals. Developing the relationships with prospective clients through networking and making new contacts throughout all levels of their organizations. Leveraging the referral sources and networks within the existing client organizations to create future opportunities. Working closely with sales management and solution design team to create relevant sales pitches to deliver to prospects. Maintaining an ongoing relationship with client contacts to assist with any operational issues after the sale is closed. Collaborating with the Maritz operations team to ensure day-to-day operations are occurring as intended and agreed upon. Offering to adjust the terms or suggests products that can be bundled to get a better price. Reviewing the changes to the deal structure with sales management and obtain their final approval. Developing the sales strategy for accounts by gathering details related to clients challenges and needs and communicate. Collaborating with solutions design to co-create more complex, value-added proposals that best fit the client's needs and sales strategy developed. 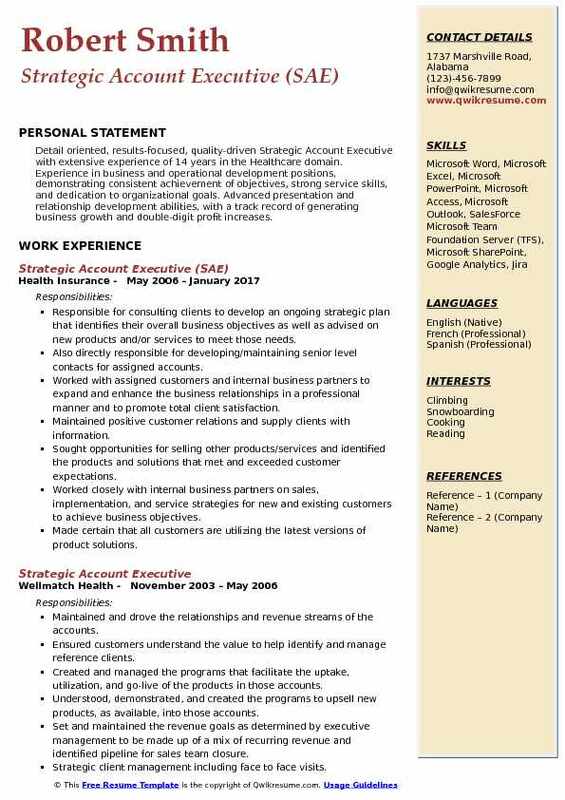 Summary : Accomplished, driven Strategic Account Executive offering over 15 years of successful sales experience in the Healthcare domain. Specializing in maintaining existing accounts and developing new ones. Involved in all aspects of solving business problems, Skilled selling into and through strategic accounts by executing solutions to meet internal and external goals of the client and my company. Skills : Sales And Marketing, Business Development, Excellent Communication, Major Account Management, Customer Retention, Problem Solving, Negotiating and Closing Up, Selling and Leveraging Business. Managed and expanded the use of Radianta products for both channel partner and direct sales. Achieved revenue and profitability objectives by driving sales to the existing customers and new prospects. Rebuilt the companies partner program increasing revenues and net sales by 25% over the prior year. Revamped product pricing, professional services, and marketing programs lifting the companies brand and product recognition. Turned around the overhaul company branding and marketing efforts resulting in Radianta’s competitive footprint. Orchestrated and implemented new sales plan and marketing focus which increased monthly revenues from existing and new business by 30% from prior years. Collaborated with the development team members in the improvement of existing and new products ensuring the competitiveness and longevity of the product set. Restructured the support and renewal program generating an increase in revenue by 50%. Recruited and managed corporate customers and channel partners expanding revenue opportunities, sales, and profit to the company. Collaborated with industry experts and partners in the healthcare field. 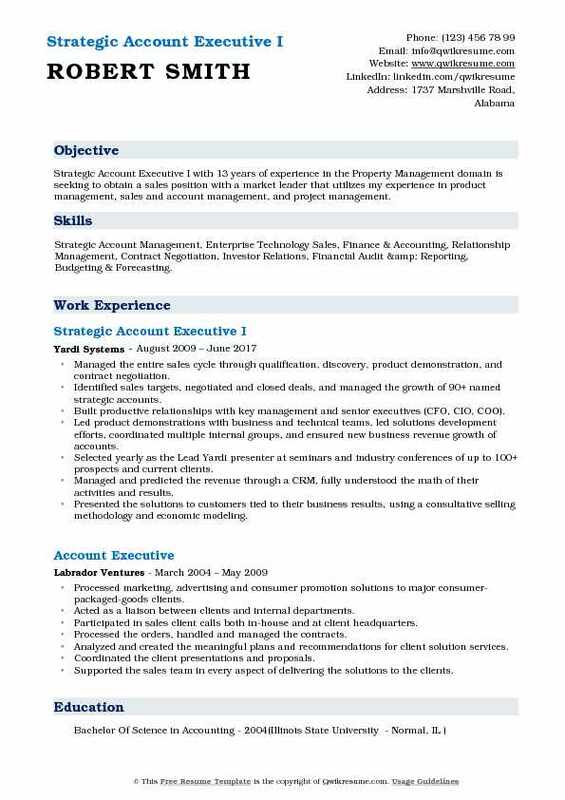 Summary : Strategic Account Executive I with 13 years of experience in the Property Management domain is seeking to obtain a sales position with a market leader that utilizes my experience in product management, sales and account management, and project management. Skills : Strategic Account Management, Enterprise Technology Sales, Finance & Accounting, Relationship Management, Contract Negotiation, Investor Relations, Financial Audit & Reporting, Budgeting & Forecasting. Managed the entire sales cycle through qualification, discovery, product demonstration, and contract negotiation. Identified sales targets, negotiated and closed deals, and managed the growth of 90+ named strategic accounts. Built productive relationships with key management and senior executives (CFO, CIO, COO). Led product demonstrations with business and technical teams, led solutions development efforts, coordinated multiple internal groups, and ensured new business revenue growth of accounts. Selected yearly as the Lead Yardi presenter at seminars and industry conferences of up to 100+ prospects and current clients. Managed and predicted the revenue through a CRM, fully understood the math of their activities and results. Presented the solutions to customers tied to their business results, using a consultative selling methodology and economic modeling. Objective : A Tenured Jr. Strategic Account Executive with 4 years of experience in the Technology domain, demonstrating outstanding strategic thinking skills and the ability to act decisively in fast-paced dynamic environments. Effective in identifying and leveraging essential information and thinking in a critical and logical manner. Possesses a comprehensive working knowledge of principles and methods of promoting products and services. Establishing productive, professional relationships with key personnel in assigned customer accounts. Responsible for client communications, conflict resolution, and compliance on client deliverables and revenue. Ensuring that client issues are dealt with in an efficient manner, informing the Operations Director of any problems that may arise. Coordinating the involvement of company personnel, including support, service, and management resources, in order to meet account performance objectives and customers’ expectations. Leading the solution development efforts that best address customer needs while coordinating the involvement of all necessary company personnel. Meeting the assigned targets for profitable sales volume and strategic objectives in assigned accounts. Approving the Change Orders and invoices, and is responsible for payment collections. Working closely with the project team in order to maintain a continuous knowledge of project status in order to identify potential issues and/or opportunities within or related to the project. Ensuring that all processes and procedures are completed, quality standards are met, and that projects are profitable. 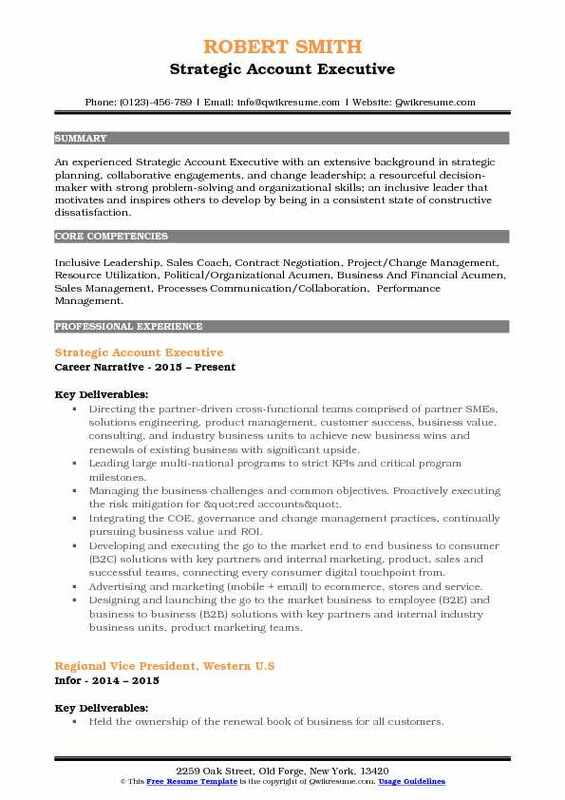 Objective : An experienced Strategic Account Executive with an extensive background in strategic planning, collaborative engagements, and change leadership; a resourceful decision-maker with strong problem-solving and organizational skills; an inclusive leader that motivates and inspires others to develop by being in a consistent state of constructive dissatisfaction. Skills : Inclusive Leadership, Sales Coach, Contract Negotiation, Project/Change Management, Resource Utilization, Political/Organizational Acumen, Business And Financial Acumen, Sales Management, Processes Communication/Collaboration, Performance Management. Directing the partner-driven cross-functional teams comprised of partner SMEs, solutions engineering, product management, customer success, business value, consulting, and industry business units to achieve new business wins and renewals of existing business with significant upside. Leading large multi-national programs to strict KPIs and critical program milestones. Managing the business challenges and common objectives. Proactively executing the risk mitigation for "red accounts". Integrating the COE, governance and change management practices, continually pursuing business value and ROI. Developing and executing the go to the market end to end business to consumer (B2C) solutions with key partners and internal marketing, product, sales and successful teams, connecting every consumer digital touchpoint from. Advertising and marketing (mobile + email) to ecommerce, stores and service. Designing and launching the go to the market business to employee (B2E) and business to business (B2B) solutions with key partners and internal industry business units, product marketing teams. Sourcing, hiring, and training the qualified team members emphasizing all aspects of customer life cycle engagement. Summary : Detail oriented, results-focused, quality-driven Strategic Account Executive with extensive experience of 14 years in the Healthcare domain. Experience in business and operational development positions, demonstrating consistent achievement of objectives, strong service skills, and dedication to organizational goals. Advanced presentation and relationship development abilities, with a track record of generating business growth and double-digit profit increases. Responsible for consulting clients to develop an ongoing strategic plan that identifies their overall business objectives as well as advised on new products and/or services to meet those needs. Also directly responsible for developing/maintaining senior level contacts for assigned accounts. Worked with assigned customers and internal business partners to expand and enhance the business relationships in a professional manner and to promote total client satisfaction. Maintained positive customer relations and supply clients with information. Sought opportunities for selling other products/services and identified the products and solutions that met and exceeded customer expectations. Worked closely with internal business partners on sales, implementation, and service strategies for new and existing customers to achieve business objectives. Made certain that all customers are utilizing the latest versions of product solutions. Summary : Passionate Strategic Account Executive with 11 years of experience with a consistent record of delivering results in new product launches, business planning, technical communication, contract profitability, and problem resolution. Consistently achieved organizational objectives to maximize sales and commercialize new product introductions. 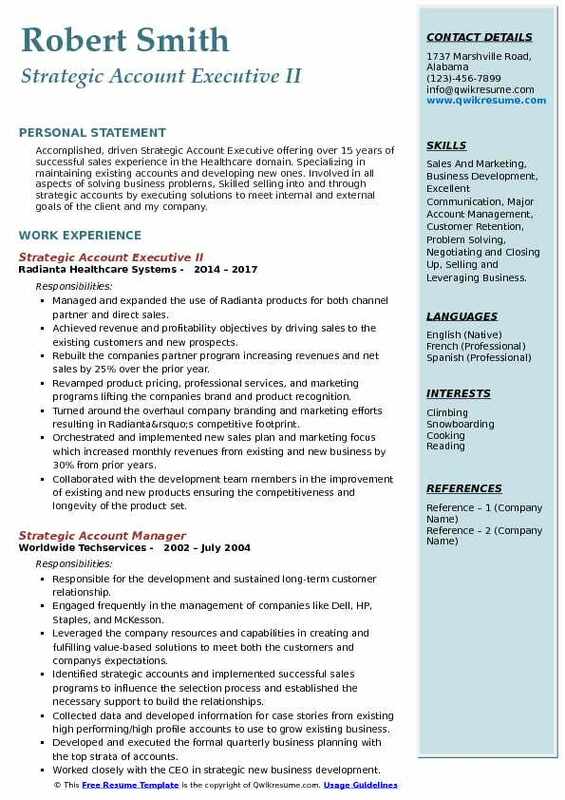 Skills : Negotiating, Planning And Organizing, Relationship Management, Research And Verification, Sales Support And Administration, Scheduling Work And Activities, Understanding Client/Customer Needs, Workflow Analysis, Risk Analysis And Selection, Proficiency In Microsoft Word, Explorer, Outlook, PowerPoint, Sharepoint And Solaris. Managed 2 large national pharmacy benefit managers (PBMS), express scripts and prime therapeutics. Successfully negotiated profitable agreements obtaining formulary status for all Novo Nordisk brands on the prime therapeutics commercial and Medicare formularies. Successfully negotiated profitable terms and conditions obtaining full formulary status for all Novo Nordisk brands on the express scripts commercial and Medicare formularies. Directed efforts which resulted in Medicare formulary positioning for Victoza and increased profitability on insulin brands at Wellpoint. Increased corporate profitability by executing a rebate reduction with express scripts while retaining the positive relationship. Increased Novo Nordisk insulin market share to record high at United Healthcare working with the national sales team. Managed the internal (business unit) and external Target customer communications. Provided direction to cross-functional resources to find insights to drive strategic plan and to execute that plan with excellence.